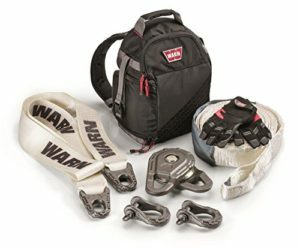 When you hit the trails, you go prepared and carry the right gear for getting the most out of your WARN winch. That’s why we offer the WARN Epic Accessory Kit. The kit includes premium WARN Epic accessories that wear durable powder coatings that protect against abrasion and the elements and stand up to the most rigorous recoveries. The components fit neatly inside the modular backpack, which also acts as a winch line damper, and is easy to transport. Available in Heavy duty (for winches 12,000 lbs. and under) and heavy duty (for winches 18,000 lbs. and under).